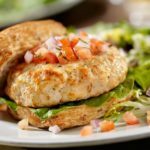 Make tonight burger night with these flavorful turkey burgers seasoned with fresh herbs. Add turkey, green onions, parsley, mustard, Worcestershire sauce, and pepper (if desired) to breadcrumb mixture; mix well with clean hands. A great protein as part of lunch or dinner.